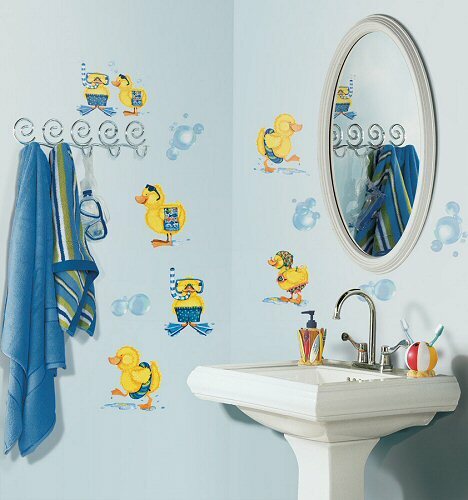 Add a splash of charm and whimsy to any room with these adorable Ducks & Bubbles wall decals. These cute RoomMates peel and stick Ducks & Bubbles wall stickers are easy to apply, easy to reposition, and are wall decor that will create a whimsical atmosphere for years to come. Our RoomMates Ducks & Bubbles wall decals (also known as wall stickers or wall appliques) are repositionable, removable, re-usable, and washable... a parent's dream combination for kids' wall decorations. Whether you are transforming bedroom, playroom, or even classroom walls, our peel and stick Ducks & Bubbles wall stickers offer decorating ease with no damage or residue to the surface when removed. Approx. .7" diameter (single bubble) to 9.25" x 8.75"
Create an imaginative and whimsical "day at the pond" atmosphere with our adorable Hoppy Pond wall decals. Create a fun barnyard, forest, or animal theme with this adorable small rubber duck fabric wall art.